The ‘Joint instrument-making company’ announced the creation of a universal robotic tracked platform URP-01G, designed to provide the greatest possible range of tasks in both peacetime and wartime. The ‘Joint instrument-making company’ (JIMC) announced that it has created a universal robotic tracked platform URP-01G, designed to provide the greatest possible range of tasks in both peacetime and wartime. According to representatives of JIMC, the platform can move at speeds of up to 40 km/h, can make a U-turn on the spot, can withstand a fall from two meters' height and can carry a payload of 2 tons. The company’s press release states that the new platform is remote-controlled and can operate at a distance of 10 km from the control point. Equipping it with the “technical vision” system and artificial intelligence are at the planning stage. Russian companies have developed a unique modular control system especially for URP-01G the, capable of operating it “without an operating system in its classic sense”. According to the chief designer, Alexey Simulin, the platform control system is based on Russian components and is highly quick-acting; it gets loaded in just 1.5 seconds. Also, it is non-specific and, in the future, can be installed in any type of machinery. The robotic platform will be used “where there is danger to a person's life” or where the presence of usable machinery is impractical for some reason, for example, in fire-fighting, military operations and work in challenging climatic conditions. The modular design of the URP-01G allows the possibility of using it with almost any payload modules by different manufacturers: for weapons, EW equipment, modules with UAVs, and so on. ‘Systemprom’ is developing two modules: the combat module, for large-calibre machine guns, and a grenade-launcher and intelligence module, for unmanned aerial vehicles (UAV). These can be mounted on a robotic platform, both together and individually. However, neither ‘Systemprom’ nor JIMC, which makes part of the platform, presented either a video, or even a photograph or a sketch of the new platform. 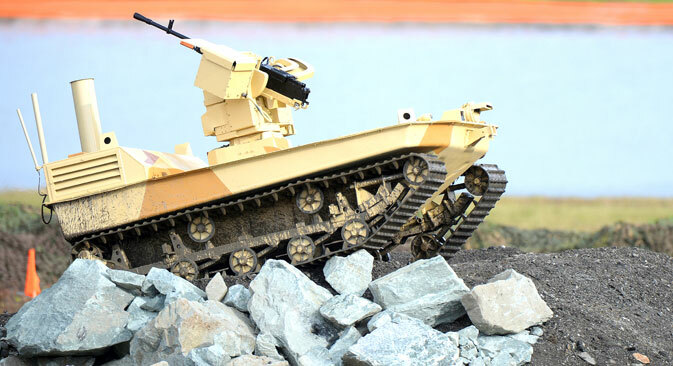 Earlier, a number of small robotic tracked platforms, armed with small arms, have been presented in Russia, such as platform-M, “Volk-2” and “Strelok,” or even ones created for de-mining such as “Uran-6”. All of these could be viewed on photo-chronicle footage, including during the exercises, but there were no indications from ‘Systemprom’ or JIMC about specific plans or the timing for mass supplies of the robotic platform to the army.